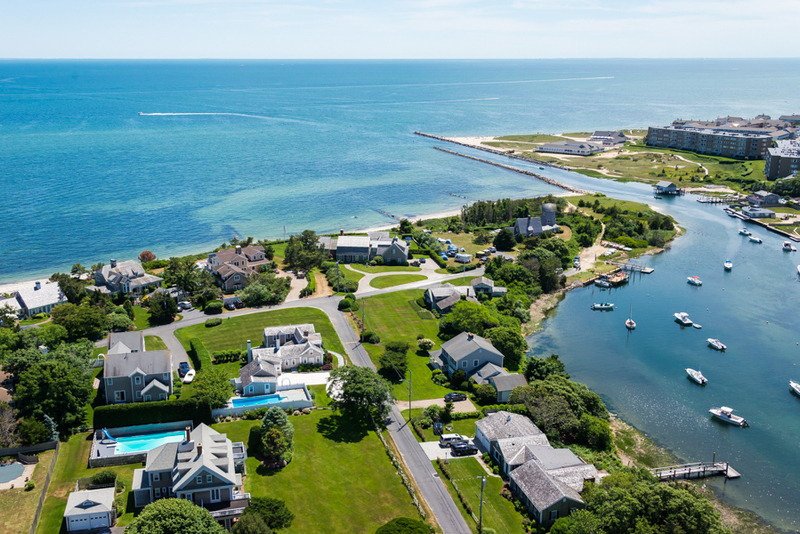 The Town of Harwich is a resort and residential community located on the south side of the Cape peninsula, with an extensive shoreline on Nantucket Sound. It was settled around 1665, and incorporated in 1694. Its early economy included agriculture and maritime industries and its history has included boom and bust cycles from the earliest days of the community. When the whaling industry collapsed with the discovery of oil, the community's emphasis shifted to cod fishing. By 1802, 15 to 20 ships were shore fishing and another four ships were cod fishing in Newfoundland and Labrador, and by 1851, there were 48 ships employing 577 men and bringing in thousands of tons of cod and mackerel. The eventual decline of the fishing industry in Harwich by the latter part of the 19th century was caused by increases in the size of ships which eventually outstripped the shallow port's ability to house them. Residents turned to the development of cranberry bogs and resorts for summer visitors, working side-by-side with Portuguese immigrants. The first resort hotel opened in 1880 and both the cranberry and the tourist industries remain substantial parts of Harwich's economy in the present. The Route 28 corridor and suburban development has significantly decreased the remaining agricultural landscape, but the town retains much of its 19th century character.